Exercises have huge benefits on the human species because few of the body movements for a certain period can result in keeping up the body weight. As overweight or obesity is susceptible to lead to various critical health conditions including certain types of cancer, heart diseases or type 2 diabetes, it is better to work out when you have time. Moreover, if you have been dreading to flaunt your favorite sleeveless dress for months because of the arm fat, you can try out easy workouts at home. What do You Know about Arm Fat? The arm fat is not a healthy condition it works as a risk factor indicating that you may develop type 2 diabetes, cardiovascular disease and hypertension. People who have fat stored in their hips or legs do not have high chances of the mentioned health conditions. The genetic factors have a major role in regulating what your body type will be or how you will lose or gain weight. Few of the genetic aspects in the body are linked to the fat distribution in the body and are capable of controlling insulin resistance, triglyceride level and insulin. In addition to the context, for women, during menopause, the activities of the hormone can move body weight of the lower body to upper body and abdomen. Many adolescent girls are not encouraged to perform normal push-ups from an early stage and this can develop flabbiness in the upper portion of the body. Why is Workout Important for Losing Arm Fat? Some of the body parts are loaded with stubborn fat and arm fat is one of the consequences of such condition. The flabby portion of fat even extends towards the arms that lead to hanging fat around the armpits limiting one’s wish to beautiful strapless summer dresses. If one follows a proper exercise routine, he/she can bid goodbye to arm fat that kills the confidence of many people. The simple workout routine including several styles of push-ups and other home exercises can get rid of arm fat quickly. 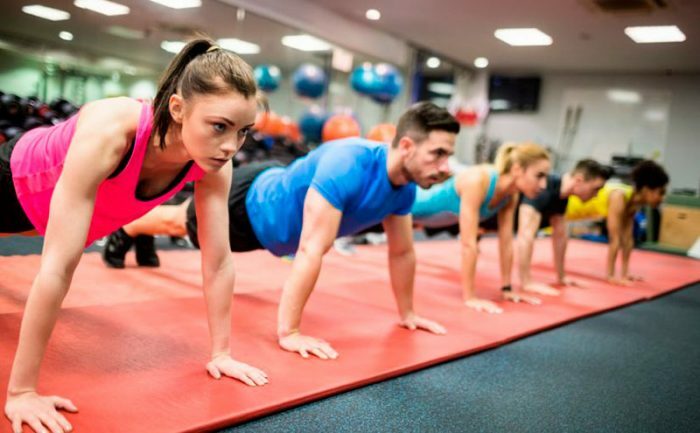 Push-up is a common workout that anyone is recommended at the time of initiating a new exercise plan and along with a proper diet, the exercise can give you toned arms. One can do pushups for two to three weeks and at least up to eight to twelve sets for strengthening the upper body. In addition to the context, the progress is dependent on the body type. For moving triceps, the American Council on Exercise has recognized triangle push up as one of the best pushups for the triceps. 3 upper body exercise moves are generally undertaken in every week on non-consecutive days and the inclusion of 3 three eight of twelve or eight may involve the following workouts. At first, you need on the floor on your stomach. Now you have to prepare yourself for the pushup position and keep the feet together. Keeping the hands apart, you should keep the elbows straight as well. By bending the elbow, you have to move the body towards the ground and ensure that the stomach does not get to touch the surface. Now you have to do three sets of repetitions daily to maintain toned arms. Again by keeping the hands wider than the shoulder, you can perform open push-ups. The close push-ups can be performed by keeping the hands close together. At first, you need to get on the push-up position and keep the hands on the chosen platform. After keeping the feet together, you have to leave the hands apart wider. The next makes you keep the shoulder and keep straight for exerting pressure on the arm muscles. For losing arm fat properly, you can continue to do three sets of twenty pushups. The first step requires you to lie on the floor on your stomach like the traditional push-up. You can bend the left elbow and next tilt the body to your left. Take the middle position and keep doing the same move with your right arm. Now you have to do the workout as long as you are comfortable with it and lose a decent amount of arm fat quickly. For keeping up muscle engagement, the triceps dips are one great example because this workout promises to give out well-tone triceps. There are 2 methods followed in gym and home and both of the procedures utilize the body weight as resistance. An individual’s shoulders, lower back, forearms and chest are engaged during the workout which can maintain balance and stabilize the body in an efficient way. Take the starting position at the time of placing the arms behind the back and have a firm grip on a rack or bench. Then you need to lower yourself from the starting position and maintain the body in an upright position. Additionally, the elbows must be tucked to the sides. Keeping the focus on lowering body with the triceps, you need to make sure that the elbows remain at a 90-degree angle. By using the triceps, you can back up the body and repeat the entire set. At first you have to kneel down with knees and hands. Then you have to keep the hands together and take the diamond position with the help of thumbs and index fingers. Now you should bend the elbows and bring the upper body down to the floor. In the meantime, it is important to keep the back straight and let the hands in the same position. The last step requires you to straighten the arms for pushing the upper body back to the initial position. The workout is as fun and easy as the name sounds quirky and the prime focus of the workout remains on shoulders alongside the arms. The first requires the use of one to two pound(s) weight and you need to stand by holding the weight in every hand. Then you have to bring the fists before the face and the palms should be facing each other. You place the left foot forward and then the right foot backward. Keeping the distance within six inches is ideal. Now you have to punch with your left fist at first and gradually speed your way up. Going as fast as you can, you have to switch the hands and repeat the whole workout for one minute maximum. 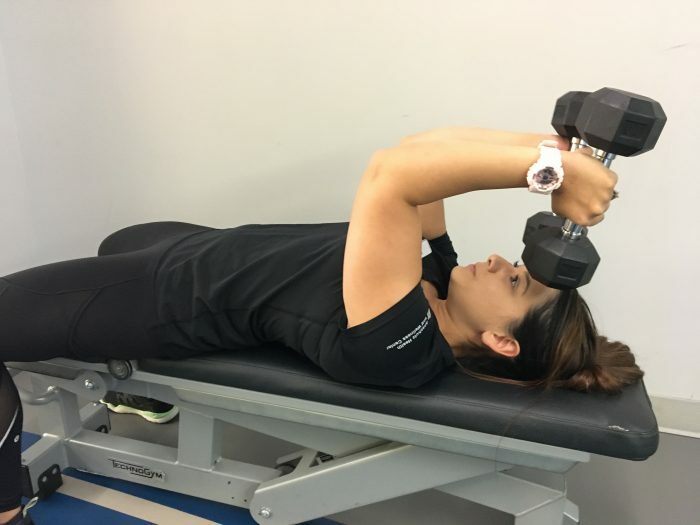 The skull crushers can be performed with a help of a table and you should perform the workout once a week for receiving the effective result on arm fat issue. Focusing on the triceps muscles, it is only an upper-body isolation workout which one has to carry out by lying. Even you get benefit out of skull crushers because it strengthens triceps and reduces arm fat at the same time. Hold a dumbbell in every hand and then lie on the back keeping your knees bent. Now gradually raise the arms above your chest and ensure that the elbows remain straight. In addition to the context, you should check whether the elbows are not locked. Lower each arm toward the head and bend the elbows to 90 degrees when the dumbbell touches the mat. It is essential to lower the weights so each one of them remains every side of the head keeping elbows bent. While being careful (because there is a risk of hitting the dumbbells on the face), you should press toward the side of the head. Now you should lift your arms and go back to the initial position and continue to do up to three sets for 10-15 reps.
At first, you need to sit on the floor and keep the feet and legs together in a place. Then place the hands on the floor keeping the shoulders width apart. At this time, the foot should be kept behind and the fingers should be pointing to the hips. Now it is essential to bend the knees and remain on the flat feet on the surface. After straightening the arms, raise the hips so that you can put weight on the triceps. The next step requires you to bend the left elbow while keeping the right arm straight. Making sure that you do not touch the surface, you have to lower the hips. Now follow the same steps to lose arm fat on the other effectively. Adding weight is always a good idea for achieving toned arms only within a few days and if you do not wish to use a dumbbell, you can always use a 2.5 liter water bottle. By performing the common hand exercises like lowering the weight or lifting it over the head can lessen your burden of arm fat. Three sets of 20 reps are the key to arm fat removed within a blink of an eye. How can You Prevent Further Development of Arm Fat? In regular intervals, you should eat small meals that can limit the hunger pangs and give you a sense of feeling full. Drinking up to three to four cups of green tea per day can restrict the chances of developing arm fat because green tea works productively for increasing metabolism. Another way to boost up the metabolism rate is to drink more water before meals. Skipping breakfast is almost equivalent to committing a sin because it is the first day of the meal which should be taken seriously. An individual can prevent calorie disposition with daily cardio exercises since skip roping, swimming, rowing and climbing can burn a great deal of arm fat. The progress of losing arm fat varies from person to person; however, the combination of proper exercise routine, diet and drinking plenty of water is the key to get success rapidly. The type of fat stored in the biceps or triceps area is difficult to remove if one does not show any interest in following easy steps at home or leading a healthy lifestyle. Henceforth, without taking help of any huge equipment, getting rid of arm fat is possible even within thirty minutes.